Yeager Airport Airshow to Honor Veterans and First Responders. 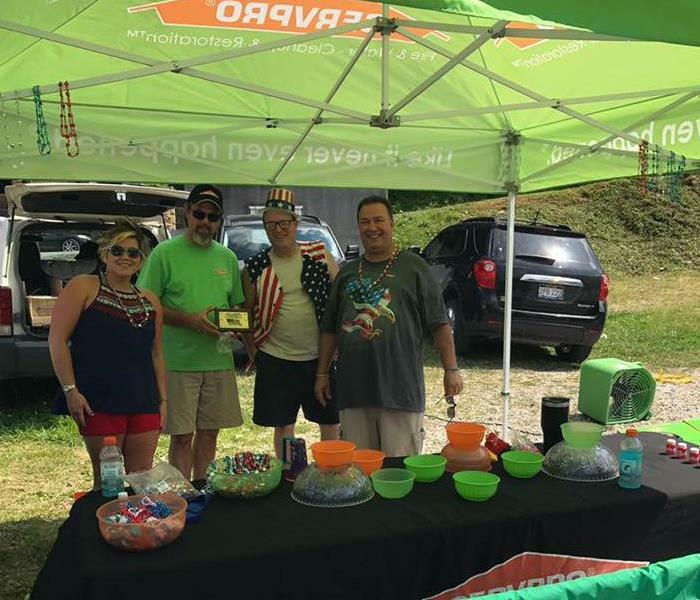 SERVPRO of Teays Valley was able to sponsor this annual event hosted by Yeager Airport that honored First Responders and Veterans. This event featured parachute teams, aerial acrobatics, tours of various airplanes, and demonstrations by the wildlife removal dogs of Fly Away Geese (pictured above). SERVPRO's sponsorship as well as many other vendors helped make this event free to the general public. 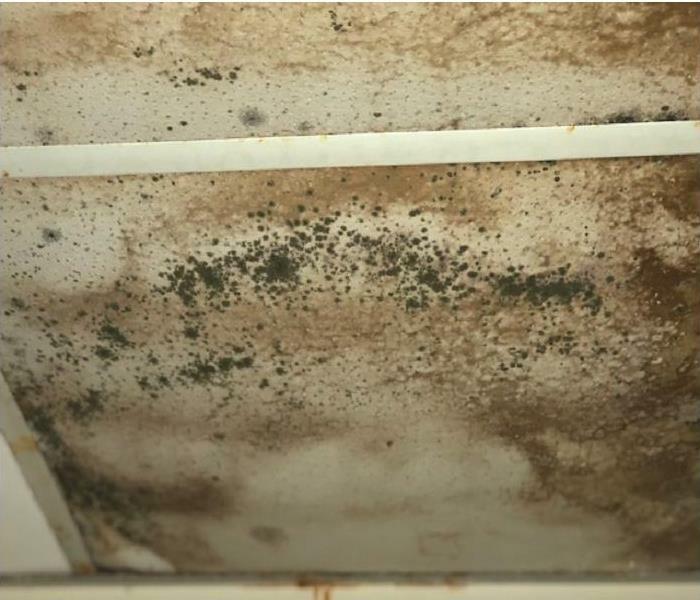 Contact SERVPRO® of Teays Valley if you suspect you have mold growing. 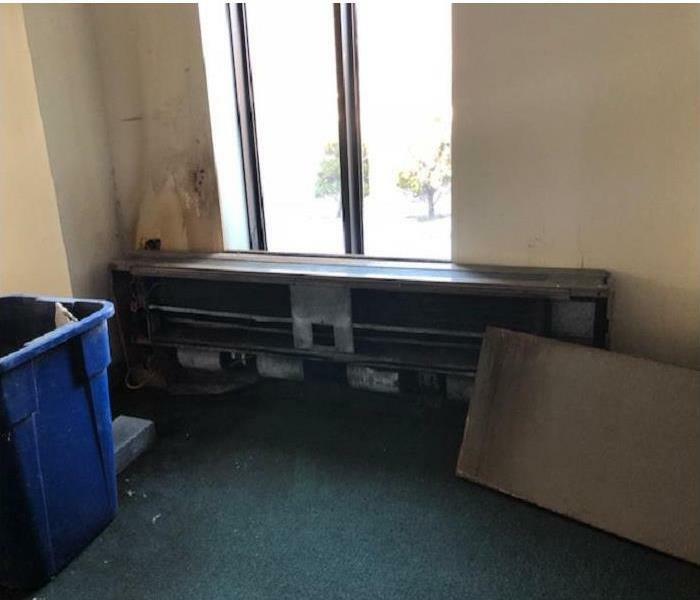 Every fire damage situation is a little different and requires a unique solution, but the general process stays the same. When various materials burn, the soot they create differs greatly and requires a specific cleaning procedure. 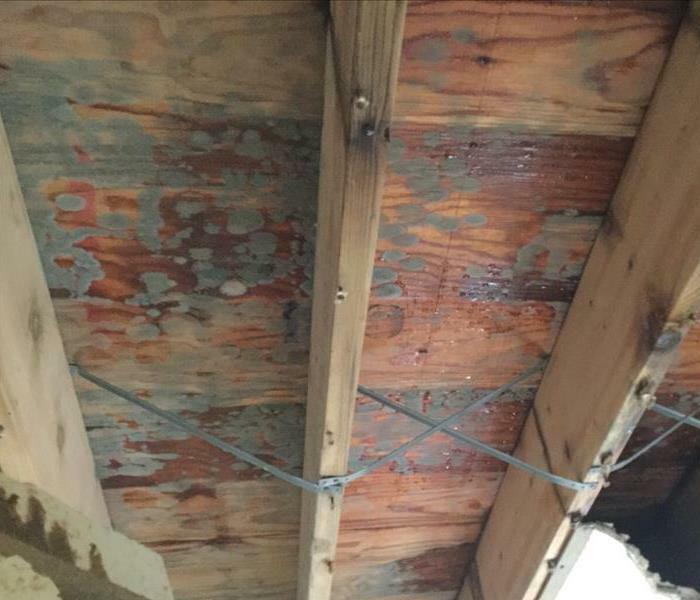 Click here to learn more about the fire damage restoration process. Call SERVPRO of Teays Valley to help you take back your home and make it "Like it never even happened." *Cooking requires attention, and barbecuing is no exception. 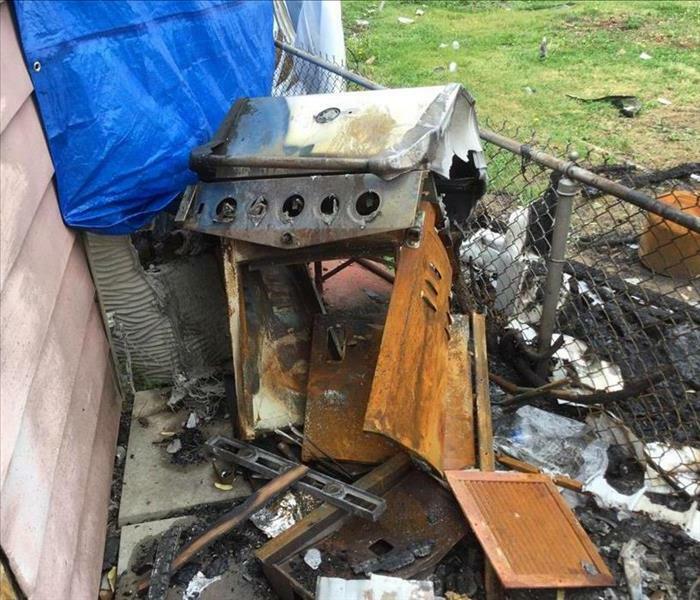 *Eleven percent of home grill structure fires began when an outside wall caught fire. Six percent began with some type of structural member or framing. *In roughly one of every five fires, the grill had not been cleaned. To prevent fires, keep the grill clean. July (17%) is the peak month for grill fires, followed by May (14%), June (14%), and August (13%). Three percent of the fires occurred in each of the winter months of December, January, and February. We received a call to do an estimate for a full kitchen remodel. 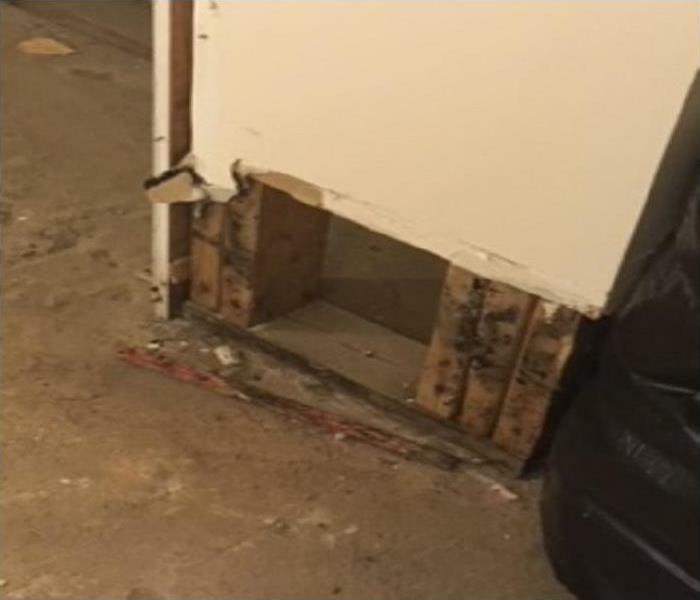 Upon arrival and starting the estimate the homeowner informed our construction manager that there dish washer line busted the night before. Causing water damage to her floor. Our guys were able to respond and start the dry out on the kitchen floor. Only a couple days later and Brian was able to begin remodeling the kitchen. Spring is known for spring showers but sometimes mother nature takes it one step to far. The downpour flooded places it normally wouldn't have flooded leaving people in a panic and homes and businesses a muddy mess. Local shelter had a small fire but with significant smoke damage. We were able to go in and get the damage cleaned up. Getting them back in working condition so that they could get back to taking care of our community. Once the water recedes, the clean up may then begin. This basement at one time was completely full of flood waters. Once the water receded we were able to gain access to the home, we were then able to begin working. Even the emergency professionals are not exempt from the flood waters. This property was another that ended up with feet of water in the building. 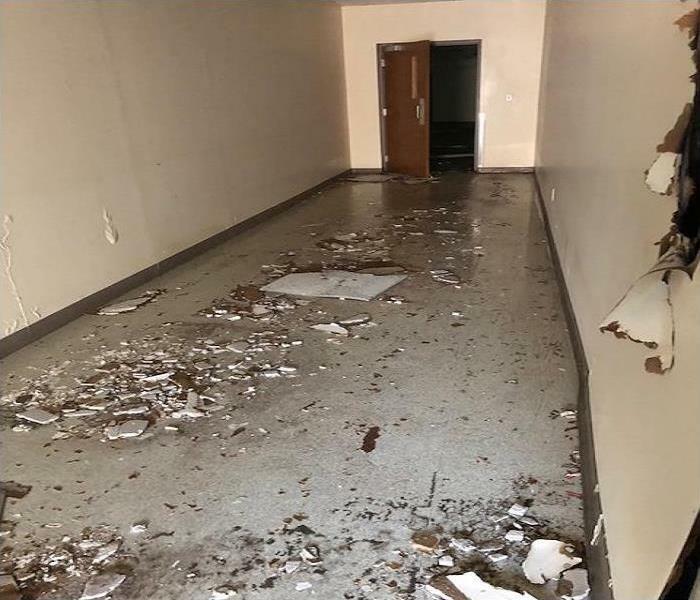 Just as the water entering the building, the growth on the walls didn't take it's time either. 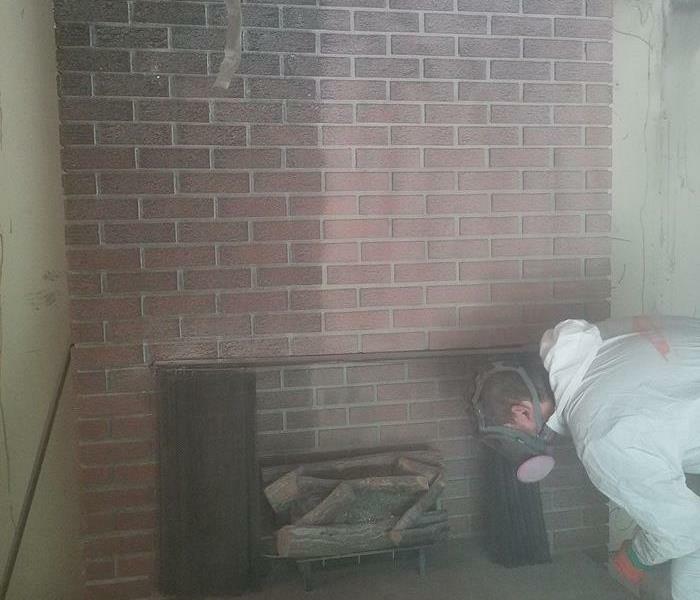 Soot from a fire in this home caused the brick on this fire place to become what appeared to be a challenging task. With no surprise we have a way to clean just about anything you can imagine. This particular fire place was cleaned with a soda blaster, this particular process is similar to power washing but no where near abrasive. It is water less and done with high pressure and baking soda. 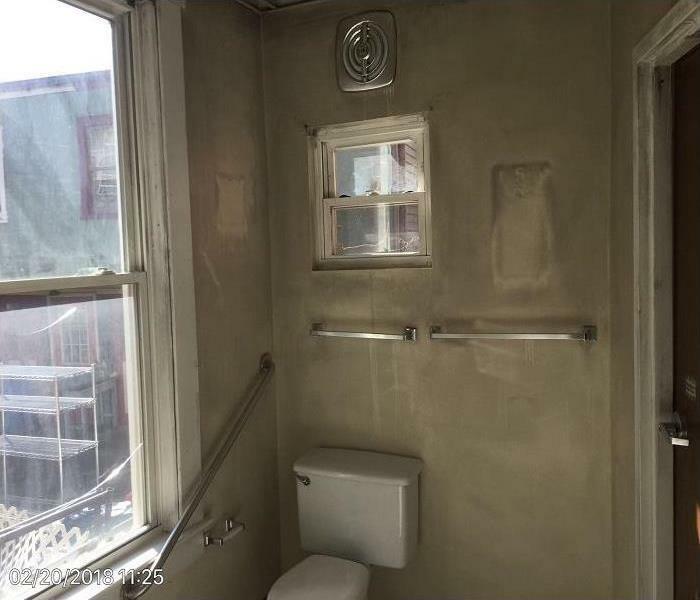 Local property flipping company purchased this property. In the process of remolding the home the home was part of an act of arson. 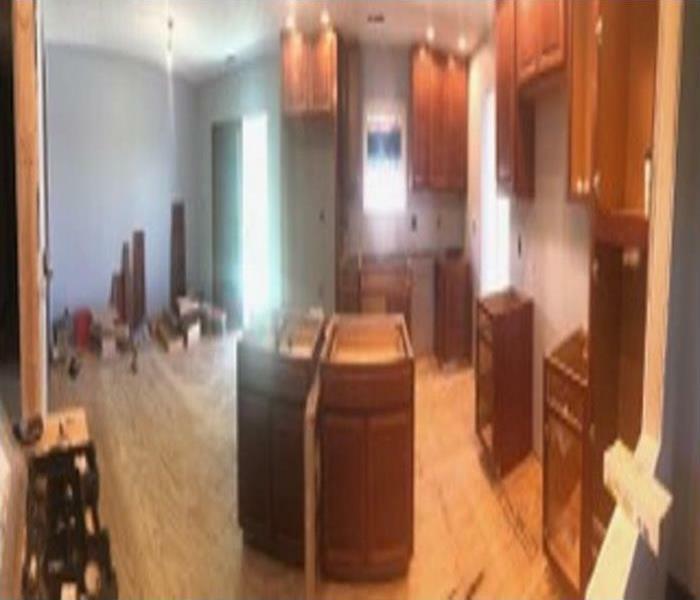 We were called into help with the restoration process so that they could proceed with their remodel. 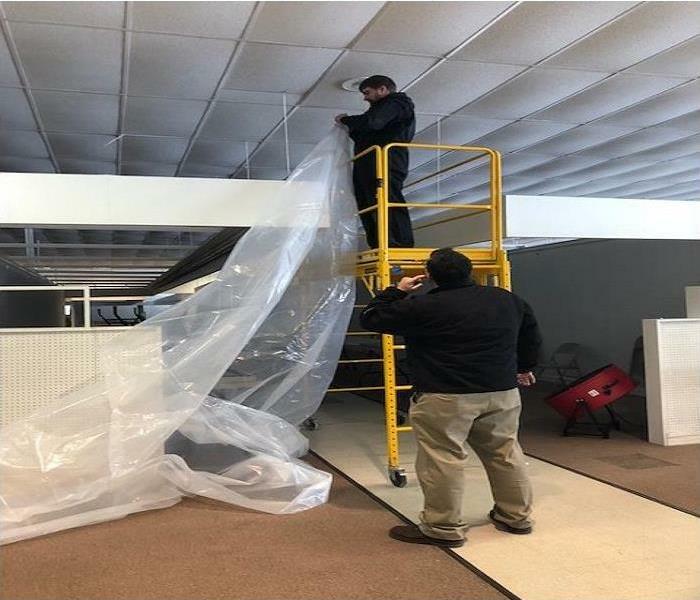 Regardless of the damage, our construction crews are able to do the put back on nearly any job. Our teams take pride and restoring the customers home or business back "Like it never even happened". In January a cold snap that lasted nearly 303 hours straight damaged many properties residential as well as commercial. No one was expecting the below freezing temperature's to last as long as they did. We had an enormous amount of different issues that came from the cold snap, frozen water pipes were a large number of them. Water damage in a large open warehouse that was only partially effected. The guys created a drying chamber to minimize time so that the warehouse could be used for an event that was coming up. 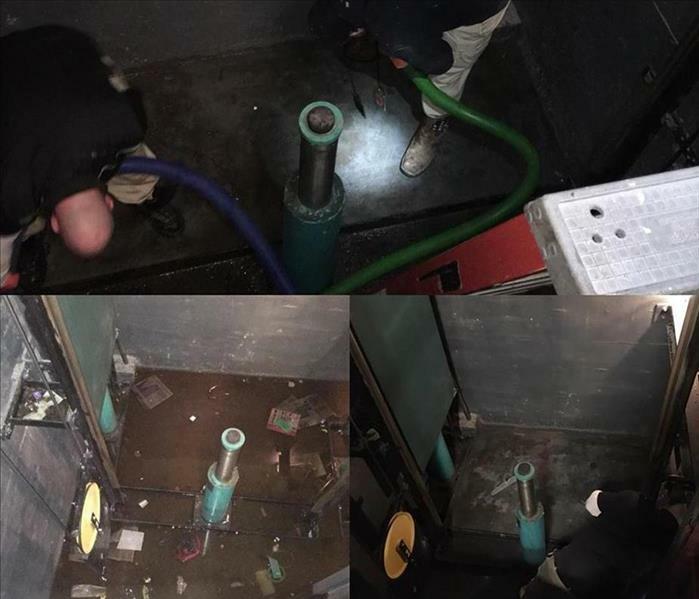 Progress pictures on a elevator shaft that took in water after a pipe burst on the 5th floor. 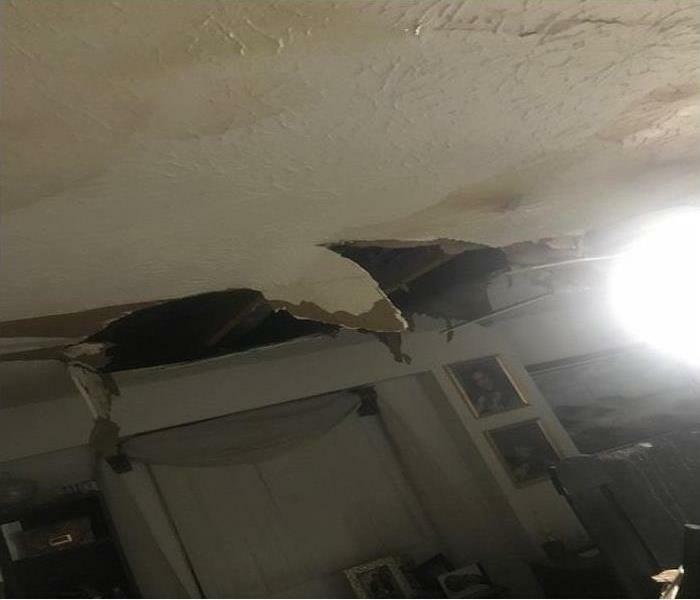 There was significant water damage throughout multiple floors. The picture shows the before, during and after of the elevator shaft. Received a phone call late one evening from a customer frantic because a valve had broken and there was water everywhere. It was moving quickly and the stair well looked like a waterfall. We arrived as the water was getting shut off, the crews worked all through the night and much into the next several days to restore this property back to working condition. We received a call from a customer who need us at his building immediately. We arrived onsite to find a vacant building that was up for sale and the fire suppressant had ruptured. Causing the company a tremendous loss. Unfortunately heavy rain happens frequently and often out of no where. On this day we were sitting in our office, the sun was shining, and the sky was beautiful. Then all of the sudden the phone began ringing off the hooks, it was then that we realized that less than 10 miles away our capital city was in the process of being drowned by a cloud burst. We were quickly sent out into our community to access the damage. That is when we were called to this local worship center that had taken in a substantial amount of storm drain water. Thankfully we were able to start their remediation almost immediately to keep from upsetting any daily routines. One year flood recovery anniversary celebration. As we all know in June 2016 our community was impacted by a truly devastating flood. This year the community celebrated the accomplishments that they have made together to rebuild. We were truly blessed to be invited to partake in the festivities and celebration that day. In May we held another one of our continuing education classes for our insurance agents. This class was about the science of drying, which allowed our agents to get four of their continuing education hours out of the way. We are great full to be able to give back to our agents and help them out. Monday, Monday, Monday unfortunately we are not the only ones who occasionally have a bad Monday! 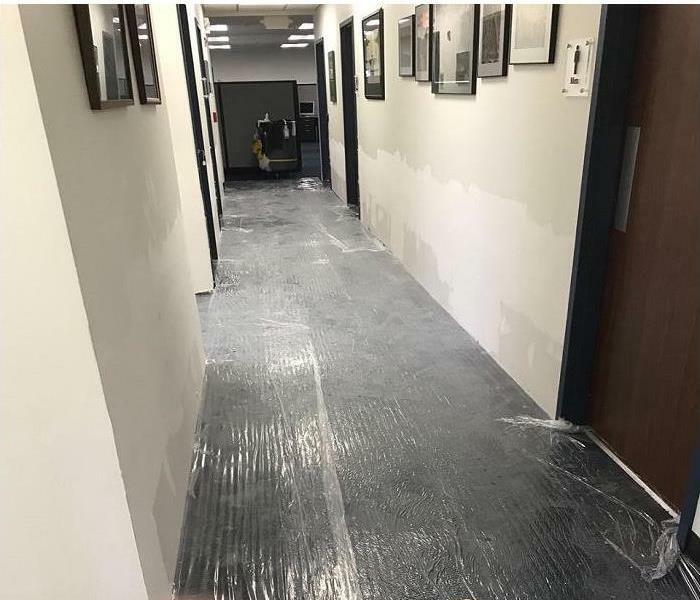 We walked into the office this morning to the phone ringing: it was a good customer calling to let us know that they walked into the office this morning to a mess and were in desperate need of our help. A hot water tank had leaked over the weekend and they had standing water in several areas. 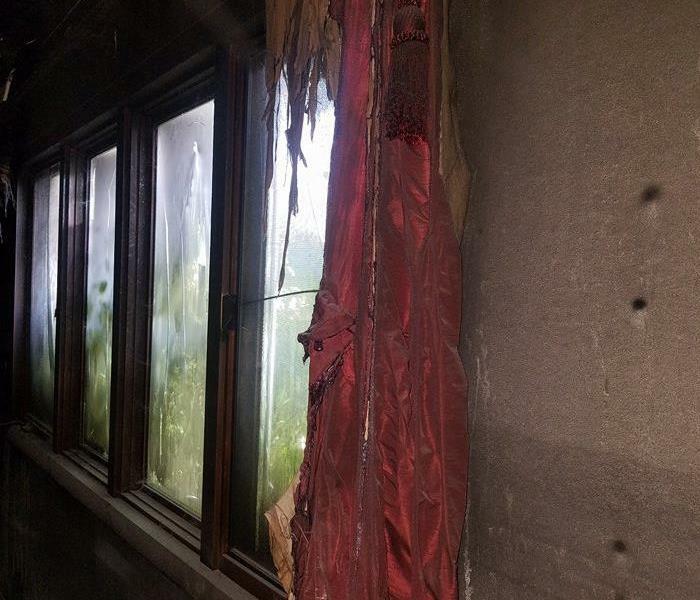 We were able to respond within the hour to get the remediation started to lessen the severity of the damage. Multiple rooms were affected which resulted in the carpet and walls needing to be dried. 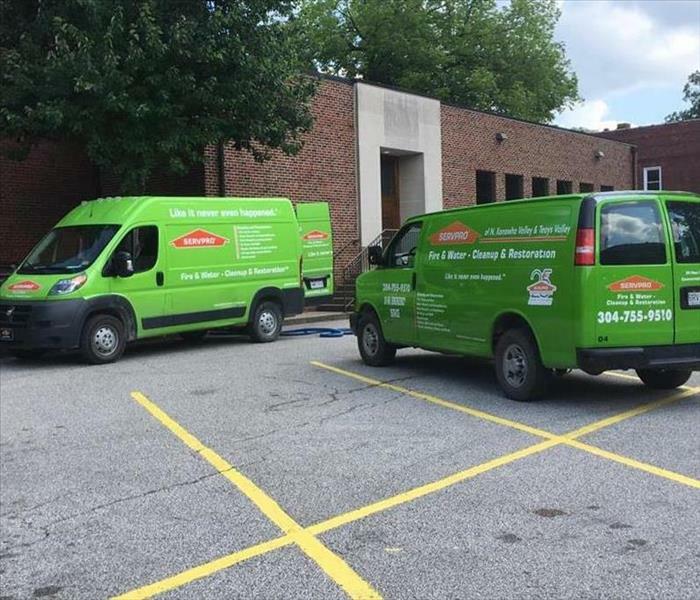 Thankfully with the knowledge and expertise that SERVPRO of North Kanawha Valley has, we were able to get the water extracted and start the drying process. When we left the site the office was back in working order. 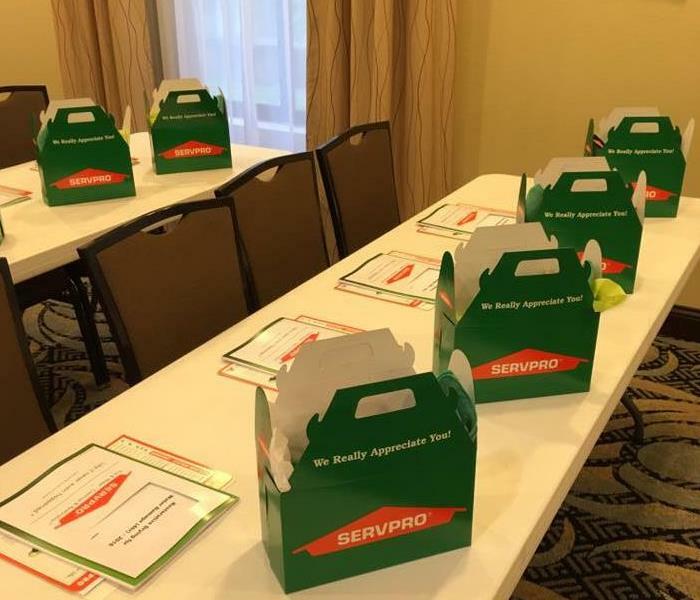 SERVPRO of Teays Valley is expanding! We are so thankful for the opportunity to expand our services to the Hurricane, WV area. This new vehicle will enable us to be even Faster to any sized disaster. The quicker we can respond to a disaster the better. 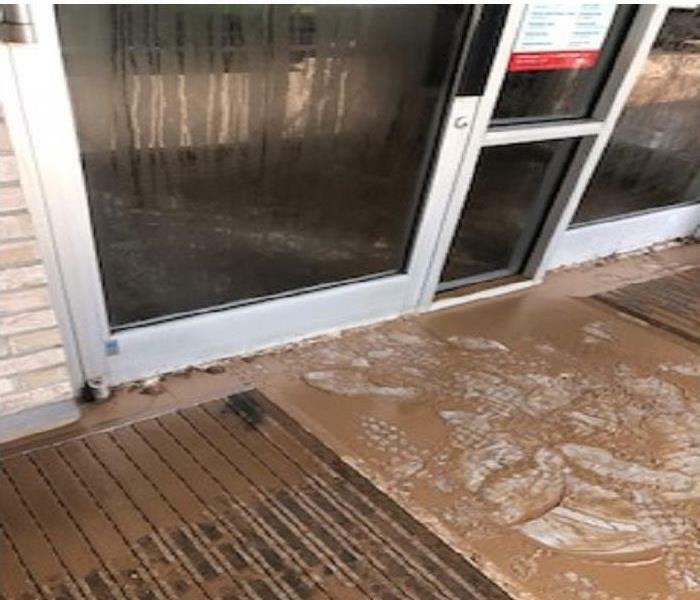 A lot of damage can be averted by not allowing secondary damage to occur from a water emergency in your home, or business. 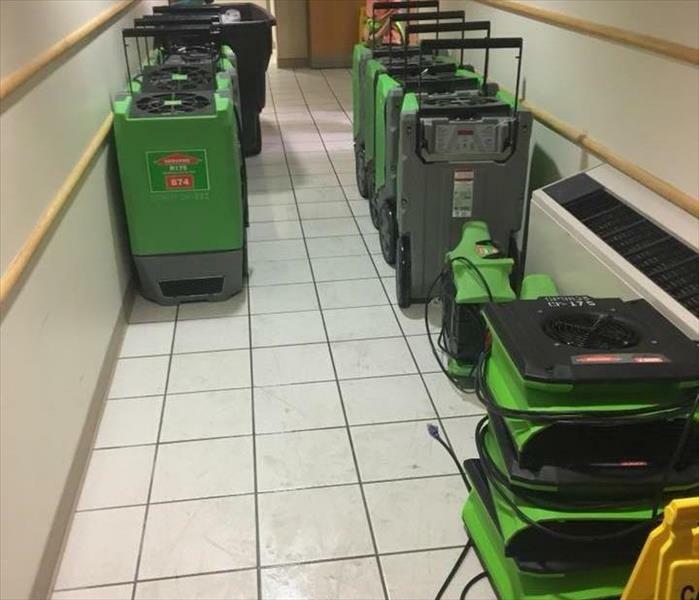 The faster SERVPRO can extract standing water and start the drying process the better. This new Vehicle will allow us to continue to provide the great service our customers have grown to appreciate.